MSSC Recruitment 2018-2019 Notification is issued by the officials of the Maharashtra State Security Corporation. And in the advertisement, they mentioned about the thought of hiring eligible candidates for 500 Lady Security Guard Vacancies. So, the officials of the organization are looking for the hard working and efficient contenders. Therefore, all the aspirants who are searching for the Police Jobs can check this post. Becuase, this is a huge opportunity for all the contenders. So, while accepting the application form for MSSC Recruitment 2018-2019, the officials of the organization are going to look for some qualifications in the applicants. As per the information in the advertisement, the people who are applying need to have the education qualification correctly. So, applications will be considered if the applicants finished either 10th Class or Madhyamik from any recognized institute or Board in India. Find more information, by check other sections of the article. Finding difficulty in getting information about MSSC Recruitment 2018-2019 Notification? then this article is made especially for such contenders. All you have to do is check this post till the end. And then proceed to apply for the MSSC Openings 2018-2019 if you are interested and eligible for the Vacancies. So, apparently, the organization has started accepting the applications from the people. Therefore, those people who are willing to apply should move fastly and check the details. And then proceed to apply for the MSSC Recruitment 2018-2019 before the closing date. According to the information in the advertisement, all the people need to submit the application form in the prescribed format before the due date. Officials of MSSC mentions that the closing date to submit the application for MSSC Recruitment 2018-2019 is 15th March 2018. The closing date is very near. Therefore, all contenders should notice this. Check the table. And it contains all the information that is given in the MSSC Recruitment 2018-2019 Notification. All the Contenders who are willing to apply can check the table. Now, here in this post, we are giving the Name of the Vacant post, Number of Vacancies, Starting Date, Final date to submit the application form, Process to submit the application form, Mode of application submission, Official site to check the details. Apart from all these, you can even find some simple steps. These will help all the contenders who are having all the qualifications correctly to submit the MSSC Recruitment 2018-2019 application form before the closing date. Remember that having some Qualifications will not make you eligible. Check the next sections of this article. Tired of looking at different sources about MSSC Recruitment 2018-2019 Notification? then relax now. This post contains all the information that is given in the advertisement. So, coming to requirements list, after the educational qualification, all the people should have the correct age. As per the information that is given in the MSSC Recruitment 2018-2019 Notification, Applicants minimum age is 18 years. And the Maximum Age of 28 years is acceptable. And there is even some Age relaxation for some categories. Therefore, consider this and check the advertisement, to get the details about the age relaxation. Please note the fact that, even though you submit the application form before the final date in the asked format, you will be rejected, if you are not fitting all the criteria that are mentioned in the advertisement. All the people should notice this. Now coming to the topic of the selection rounds. The Officials of the Maharashtra State Security Corporation mentioned that they are going to choose the people based on the performance in the hiring process. As per the information in the official MSSC Recruitment 2018-2019 Notification, all the applicants have to clear the selection rounds which comprises of Written Examination follows by personal Interview. Therefore, all the applicants as soon as applying have to start their preparation for the Recruitment Rounds. Keep this in mind. And do not worry about the gathering the Preparation materials. Because on our site, we arranged them all on behalf of the candidates. So prepare well. Remember that only your merit and Performance are considered at final. And the Final decision on recruiting an individual will be on officials of the MSSC. Now coming to the Salary details, all the people who will get job in the organization will get Rs.14,000/- Per Month. And for the Pay scale and Grade Pay information, check the advertisement twice. so, all the people should also know about the application fee. Those applicants who will not pay the application fee, such application are invalid. Keep this in mind. And proceed. According to the information in the official MSSC Recruitment 2018-2019 Notification, all the people should pay the Application Fee before the closing date. According to the notification, applicants have to pay Rs.200/- as the application fee. Remember that without application fee, your application is invalid. Apart from that, the candidates should submit the application form in the mentioned format only. Also, the mode of application is Online. To help all such aspirants here we are writing this post. So, that the contenders can get complete information about MSSC Recruitment 2018-2019. Down in this article, we even gave all details in brief. Apart from all these, the candidates will also find some steps. Check the next sections of this article. You will know all information more clearly. And you can even download the notification. Read all the details given in the advertisement. if eligible pay the application fee. 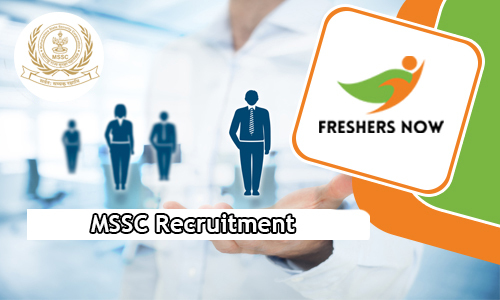 Freshersnow.com is a place where all the people can get Fast Updates like MSSC Recruitment 2018-2019 Notification. Comment and let us know in the comment section if you want to know about any other notifications. We will get them for you.